A little blue heeler pup from the hilly suburbs of Brisbane has won the hearts of families across the country. In just a few short months, animated series Bluey has become one of the top children’s programs in Australia and is set for more exciting developments in 2019. The series follows six year-old Bluey, an adorable and inexhaustible pup who loves to turn everyday life into playful adventures, developing her imagination as well as her mental, physical and emotional resilience. Each episode unfolds in unpredictable and hilarious ways with her dad, Bandit, mum, Chilli, her little sister, Bingo, and her neighbourhood all brought into the fun. Since premiering on ABC KIDS and ABC iview in October 2018, the show has become an instant family favourite, dominating both iview and broadcast. To date, it is the most watched series ever on iview with over 21.3 million views and last year it was the top Australian children’s series on broadcast television in the country1. On iTunes, a collection of episodes jumped straight into the overall top ten and peaked at number one in the children’s television chart. There is plenty of buzz around the series, with parents jumping on to social media to share their appreciation for the series. Bluey stands out in the children’s television landscape for a number of reasons. The show takes an authentic and very funny view on family life with young children, making it a feel-good show that parents and children can enjoy together. Creator Joe Brumm based the series on his experience of raising two daughters, showing both the joys and frustration of parenthood which makes the series very relatable. It’s honest and refreshing portrayal of modern parenting has been widely praised. Bluey’s parents work together to juggle work, raising kids and finding time for themselves. Both are dedicated parents who, tired as they might be at times, appreciate the value of playing with their kids. Bluey is a home-grown hit, made entirely in Brisbane by the award-winning production team at Ludo Studio, including creator and writer Joe Brumm (Charlie and Lola), Emmy award-winning producer/executive producer Charlie Aspinwall (Doodles, #7DaysLater), Emmy award-winning executive producer Daley Pearson (#7DaysLater, The Strange Calls), and animation director Richard Jeffery (Tinga Tales). The show has a unique Australian setting, beautifully depicting the lush and hilly Brisbane suburbs and landmarks. For local viewers the Australian accent adds to its appeal and authenticity. David McCormack (frontman of Australian band, Custard) and Australian actress Melanie Zanetti voice Bluey’s parents, with a number of famous Australians lending their voices throughout the series, including former world surf champion Layne Beachley, TV and radio presenter Myf Warhurst and singer Megan Washington. While uniquely and beautifully Australian, the messages behind Bluey are universal. At its core, it is a celebration of the role imaginative play has in children’s development and is a timely reminder of the importance of family time for parents and children, especially in an age of multiple screens and devices. Each seven-minute episode tells a wonderful story, highlighting the joys and frustrations of parenthood, the importance of imaginative play and the magic of childhood. 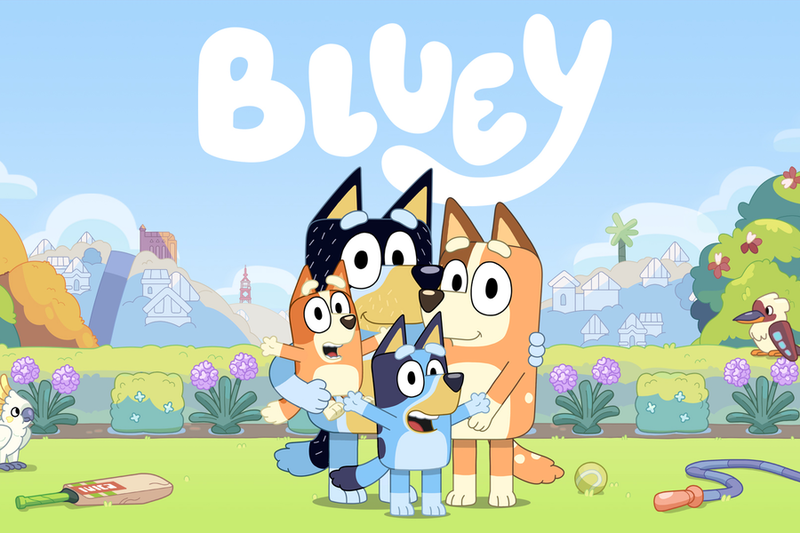 Bluey is a Ludo Studio production for the Australian Broadcasting Corporation (ABC) with principal production investment from the BBC Studios, ABC and Screen Australia and was developed and produced with the assistance of Screen Queensland. New episodes of Bluey are coming soon to ABC KIDS and iview, much to the delight of its fans across Australia. The series will also screen on kid’s channel CBeebies in the future.